Wayne Taulapapa, a 5’11” 202 pound running back, has de-committed from the BYU football team. Taulapapa was the 16th commitment for the BYU football Class of 2016 but had his scholarship pulled following the coaching shakeup that occurred following the bowl game. While Taulapapa had not seen a lot of recruiting interest from other teams prior to the BYU offer, the Deseret News has reported that since opening his recruitment back up he’s been in contact with Hawaii, Army and Navy. 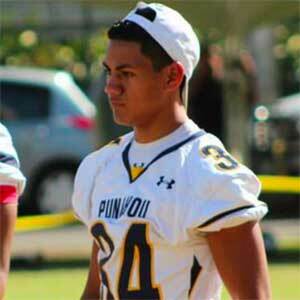 Taulapapa preps at Punahou High School, where as a sophomore he rushed 159 times for 997 yards and 14 touchdowns. He also had 10 receptions for 150 yards and three more touchdowns. As a junior he rushed 96 times for 911 yards (9.5 ypc) and 17 touchdowns in eight games. He also caught 15 passes for 114 yards, giving him over 1000 total yards of offense on the year. He was the 2014 State Championship Impact Player of the Game, and a member of the Honolulu Star-Advertiser, KHON Cover 2, and ScoringLive.com 1st teams All-State. As a senior for Punahou High School he continued to impress, rushing 180 times for 1107 yards (6.2 ave.) and 18 touchdowns this season. He also had nine receptions for 59 yards (statistics courtesy of ScoringLive.com). Against Iolani he rushed 11 times for 151 yards (over 13 ypc) and four touchdowns. Taulapapa is rated 3-stars by ESPN (grade of 71) and Scout. Scout lists him as the No. 2 RB in Hawaii and the No. 15 RB in the west while ESPN have him as the No. 8 overall recruit in Hawaii. He currently has two stars from Rivals. Taulapapa holds scholarship offers from BYU, Colorado, Hawaii, and UNLV. He was also recruited by California, Army, Navy, Oregon, Utah, Utah State, and Vanderbilt. Last Team: Punahou HT/WT: 5’11”, 202 lbs.